Even as the European Parliament moves to punish Hungary for its violation of EUâs core values, a defiant Hungarian government has said its stand on George Soros-funded Central European University (CEU) has not changed. When asked in a television show on Wednesday evening how Hungary would respond to concerns raised by the Members of European Parliament over CEU, Foreign Minister Peter Szijjarto said th e university still "expects privileges", which would be hard for the countryâs legislators "to accept". "The agreement of CEU with another US university does not mean that there is a school there," Szijjarto said, referring to a controversial amendment made in the education law last year, which required the university to also offer courses in the United States. Responding to the ministerâs remarks, the CEU issued a statement on Thursday reiterating that it has "always conformed to the Hungarian laws, and currently fulfils the requirements of the Hungarian legislation on higher education" passed in March 2017. The universityâs statement added that a delegation of Hungarian officials, led by former Secretary for Education Laszlo Palkovics, "visited CEU's New York facilities in April 2018". When asked for comment by Al Jazeera, a Hungarian government representative cited Palkovicsâ interview from June in which he had said they are "currently examining whether actual training is being performed by the CEU in the United States with the involvement of education experts". CEU, founded 25 years ago by Hungarian-American billionaire Soros known for his support of refugees and the Roma minority, is originally accredited in the New York State. 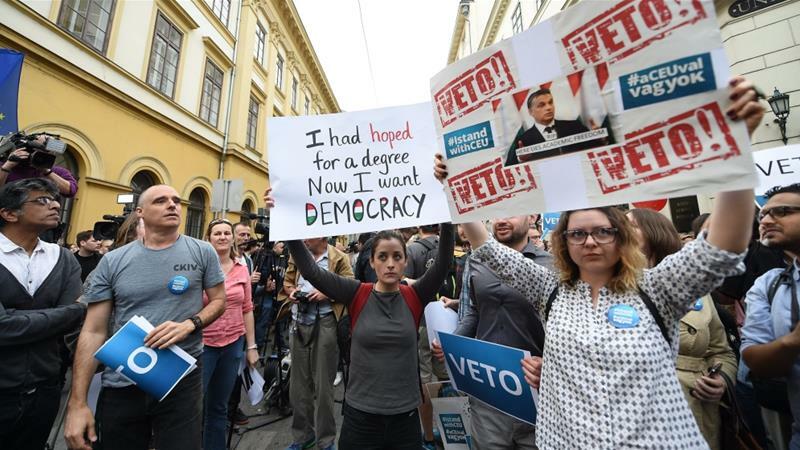 Following the passage of the law, which many in Hungary saw as part of the governmentâs wider crackdown on dissent, the Budapest-based university began holding classes in the US in partnership with New Yorkâs Bard College earlier this year. On Wednesday, the European Parliament voted to initiate Article 7 procedures against Hungary with 448 votes in favour and 197 against. It was the first time the EU legislature had triggered disciplinary action against a member state, which could strip the Hungarian government, led by Prime Minister Viktor Orban, of its EU voting rights. The punitive move was motivated in part by perceived violations of democratic principles committed by the ruling Fidesz party, known for its far-right, anti-immigration policies. Among the concerns raised at the European Parliament was the Hungarian governmentâs actions against CEU. Dutch MEP Judith Sargentini, who spearheaded the vote to enact Article 7 procedures, decried the CEU's "legal limbo" in a report (PDF) that detailed alleged violations of the EU's democratic principles. While Article 7 procedures may deny Hungary its EU voting rights, it is now unlikely to happen with Poland saying it will not support such moves. "We will veto the decision if it comes to sanctions," Polish Foreign Minister Jacek Czaputowicz told reporters in Lithuania on Thursday.